Early August traditionally provides some of the most “summerlike” weather that we experience here and this past week was no exception. Warm sunny days on mostly flat water have lots of appeal; guests and staff alike were soaking it up with almost giddy smiles! Those clear full moon nights didn’t appear to affect the fishing so much either. Chinook catches were distributed quite evenly through the day with some great fish taken in the mornings at Parker Point; Bird 1 was producing really well at mid-day Thursday and Bird 2 had decent action on Tuesday evening. The big tides were certainly a factor for those anglers who prefer traditional power mooching with weighted rods – it can be tough to get your bait where it needs to be during a 17-foot flood! But by Thursday afternoon most anglers were pretty relaxed in the knowledge that they had caught all the fish they needed and were content to just enjoy the gorgeous weather and the humpbacks feeding on baitfish throughout the fishing grounds. Guests were treated to quite a show at Bird 2 on Tuesday evening when a young (30 foot long!) humpback performed an impressive display of acrobatics amidst a dozen or more boats fishing off the point. After a series of 15-20 headstand / tail splashes the frisky whale finished of with 3 corkscrew breaches and headed on down the shoreline to the next kelp bed and more needlefish. All the while a larger whale (maybe the mother) was content to continue surface feeding in the bay right beside the anchored Driftwood. We never tire of the awesome presence of these incredible neighbours of ours! The weekend weather looks like a mixed bag with light winds from the south and west and only a chance of a shower on Friday. Tides are moderating now with small changes of 7-9 feet so QCL anglers should enjoy perfect conditions to explore the full fishing grounds and target all species wherever they want. 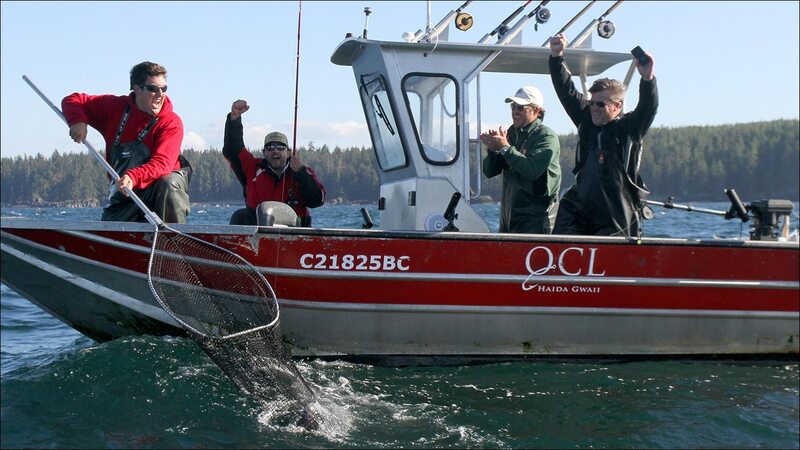 Notable catches this week were 4 more halibut over 100 pounds – Derek Muirhead released a 109 and kept a 58 pounder, Paul McNeil released a 115 and Marco Fretes a 121 pound giant. The big halibut for the trip was a 130 pounder for Bill Tucker. That’s pretty exciting guys! 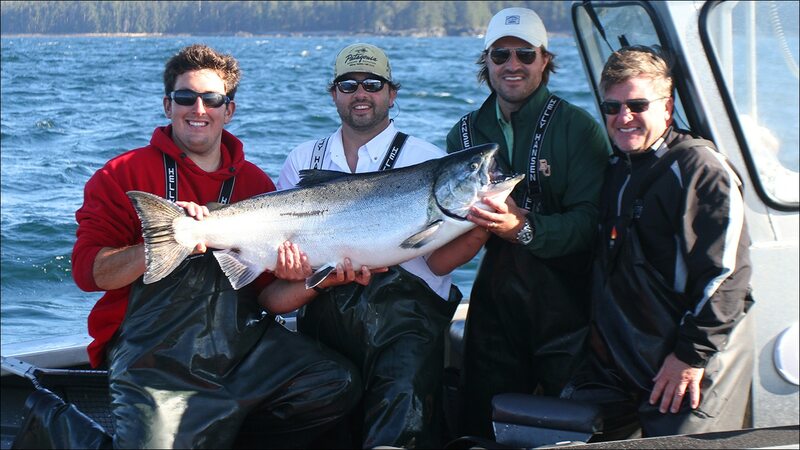 Betty Zuelke, fishing with her husband Paul and guide Sam Johnstone at Parker Point released a nice Tyee that taped out to 37 pounds. First time salmon angler Lynda Grimmon boated a stunning 42 pound Chinook with guide Kingsley Bryce and the big salmon of the week was a husky 47 pounder for Luke Jessen, fishing with guide Brett Clarke. Lots of smiles at the Bell Ringer this week!